Here is an example of uneconomic selling–the price decline has nothing to do with the underlying operations or the price of the product the firm is selling (precious metals and aggregates). The marginal seller sets the price no matter how unintelligent. Seth Klarman always sought out these types of situations. If you have an understanding of the company’s fair value, then you perhaps get a gift. I heard from the grapevine that John Doody of The Gold Stock Analyst put out a sell recommendation because Golden Queen would defer paying dividends once the company reached full production so as to explore and expand the existing mine. His newsletter does NOT cover explorers, so he recommended selling. The decision was correct for him, but his subscribers all tried to leave the room through the same exit. GQMNF traded over 6 million shares or about 100 times the normal daily volume of 60,000 shares. There is more selling likely over this week and next. When IKN gets one wrong, your humble scribe has no problem in eating a slice of humble pie. That happened last night when in this short post I wrote that the big share price drop in Golden Queen (GQM.to) was due to selling from the partner Clay family. That’s not right. In fact, the drop was due to John Doody issuing a sell call to his newsletter subscribers. Therefore, IKN corrects. Or as one of the people kind enough to wrote into IKN this morning noted, “They did the same thing to Minefinders, Eldorado and most recently, as you are aware, Sandstorm. Each time was a great buying opportunity”. True that. This entry was posted in Search Strategies, YOU and tagged forced selling, Investing psychology. Bookmark the permalink. This is definitely not the first newsletter writer I’ve seen cause a miner to crash unjustifiably. This is more of a lesson on illiquidity regardless of the merits of the business. GQMNF is far from perfect, but its business did not change 35% in a day. The selling has continued. Are you following this stock? Yes, the company has impending debt payments and will so a rights offering then couple that with tax loss selling–this will be pressured. As a reference, GQMNF sold 1/2 of its project for the equivalent of 80 cents per share two years ago. Read the recent 10-Q and the rights offering which should be announced in a few days. Remember these miners are VERY risky. The company is screwing residents of certain states by claiming issuing shares via a rights offering may violate the states’ securities laws, so the rights aren’t even issued to us, BUT if we can somehow prove to them it doesn’t violate the states’ laws, then they will mail us the rights. Thanks for all the help. The company doesn’t offer its opinion of precisely what the violation is. It appears the whole set up is designed for maximum benefit to the Clay family. I’m no expert but it looks to me like if the rights had been listed on NASDAQ rather than just the Toronto exchange, there would have been no issue in Ohio. What you say is concerning. Let me check on that. Thanks. GQMNF sold 50% at a valuation of 80 cents per share two years ago to Leucadia. The CLAY family (huge insiders and holders of the debt) smell of self-dealing. 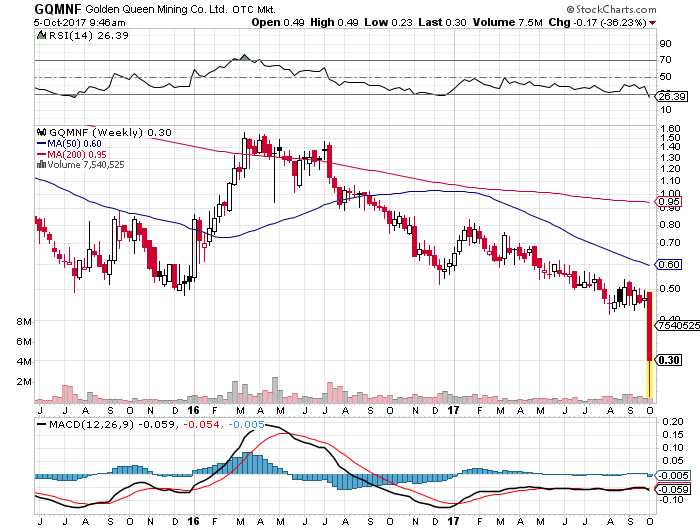 eVANCOUVER, BRITISH COLUMBIA – January 12, 2018 – Golden Queen Mining Co. Ltd. (TSX:GQM | OTCQX:GQMNF) (“Golden Queen” or “the Company”) announces that further to its November 14th and 28th, 2017 news releases the rights to acquire common shares of Golden Queen will commence trading on the Toronto Stock Exchange on January 16, 2018 under the symbol GQM.RT. The rights may be exercised beginning January 12, 2018 and will expire at 5:00 p.m. (Toronto time) on February 20, 2018. All holders of the Company’s common shares as at the close of business (Toronto Time) on December 1, 2017, were issued one right for every common share held. Certificates representing the rights will be mailed to shareholders in eligible jurisdictions along with copies of the Canadian and U.S. prospectuses. Eligible shareholders are those shareholders resident in the provinces of British Columbia, Alberta, and Ontario and the United States, except for the states of California, Ohio, Arizona, Arkansas, Minnesota and Wisconsin. Shareholders who own their common shares through an intermediary, such as a bank or broker, will receive materials and instructions from their intermediary. For each right, the holder will be entitled to subscribe for 1.7 common shares at the subscription price of US$0.1325 per common share; no fractional common shares will be issued. The rights offering includes an additional subscription privilege under which holders of rights who fully exercise their rights will be entitled to subscribe for additional common shares, if available, that were not otherwise subscribed for in the rights offering. If a shareholder does not exercise all of its rights pursuant to the basic subscription right, the shareholder’s equity in the Company will be diluted by the issuance of common shares upon the exercise of rights by other shareholders. If you have any questions relating to the rights offering, please contact the information agent, Laurel Hill Advisory Group at 1-877-452-7184 (toll-free in North America), 1-416-304-0211 (outside North America), or by email at assistance@laurelhill.com or the subscription agent, Computershare Investor Services Inc. at 1-800-564-6253, 1-514-982-7555 (outside North America), or by sending an e-mail to corporateactions@computershare.com. The Company has registered the offer and sale of the shares issuable on exercise of the rights pursuant to a registration statement on Form S-3 (No. 333-221969) under the U.S. Securities Act of 1933, as amended. Shareholders should review a copy of the registration statement and U.S. prospectus which can be found on the U.S. Securities Exchange Commission’s website at http://www.sec.gov or are available upon request to the Company at Corporate Secretary, Golden Queen Mining Co. Ltd., #2300 – 1066 West Hastings Street, Vancouver, BC V6E 3X2, telephone: (778) 373-1557 or by email to info@goldenqueen.com. Golden Queen is a gold and silver producer holding a 50% interest in an open pit, heap leach mining operation on the Soledad Mountain property, located just outside the town of Mojave in Kern County in southern California. The mine also produces aggregate rock. Caution With Respect To Forward-looking Statements:This news release contains forward-looking information and statements within the meaning of applicable Canadian and United States securities laws (herein referred to as “forward-looking statements”) that involve known and unknown risks, uncertainties and other factors that may cause actual results, performance or achievements to be materially different from any future results, performance or achievements expressed or implied by such forward-looking statements. All information and statements in this news release that are not statements of historical fact may be forward-looking statements, including references to the rights offering expiry date, trading of the rights on the Toronto Stock Exchange, the mailing of certificates and materials to shareholders, closing of the rights offering, the mining operation and future production results, grade and quantities or ore, operating costs, and plant capacity. Such statements or information are only intentions and expectations of management and reflect the current beliefs of management and are based on information currently available to management. In addition, results of operations can vary significantly and past results may not necessarily be consistent with future results. Actual results and events may differ materially from those contemplated by these forward-looking statements due to these statements being subject to a number of risks and uncertainties. Undue reliance should not be placed on these forward-looking statements, as there can be no assurance that the plans, intentions or expectations upon which they are based will occur. By their nature forward-looking statements involve assumptions and known and unknown risks and uncertainties, both general and specific, that contribute to the possibility that the predictions and other forward-looking statements will not occur. A number of factors could cause actual results to differ materially from the those expressed or implied by the forward-looking statements, including, but not limited to, unexpected regulatory issues, and changes in the general economic and business conditions pertaining to Golden Queen’s operations. Should any risks or uncertainties that face Golden Queen and its subsidiaries materialize, or should assumptions underlying the forward-looking statements prove incorrect, actual results or achievements could vary materially from those expressed or implied by the forward-looking statements contained in this news release. Readers are cautioned that the foregoing list of risks is not exhaustive. Additional information on these and other factors that could affect the operations or financial results of Golden Queen and its subsidiaries are included in, the Canadian Prospectus, the U.S. Prospectus and Golden Queen’s annual report on Form 10-K, annual financial statements and Management’s Discussion and Analysis for the year ended December 31, 2016, and subsequent quarterly periods, each of which has been filed under the Company’s profile on SEDAR (www.sedar.com) or with the SEC (www.sec.gov). Any forward-looking statement herein contained is made as of the date of this news release and Golden Queen does not assume any obligation to update or revise them to reflect new information, events or circumstances, except as required by law.